One of my all time favorite sets, the elder brother of a friend had the blue version of these in a little tobacco-box and when he went off to boarding school, his younger brother and I split them between us! 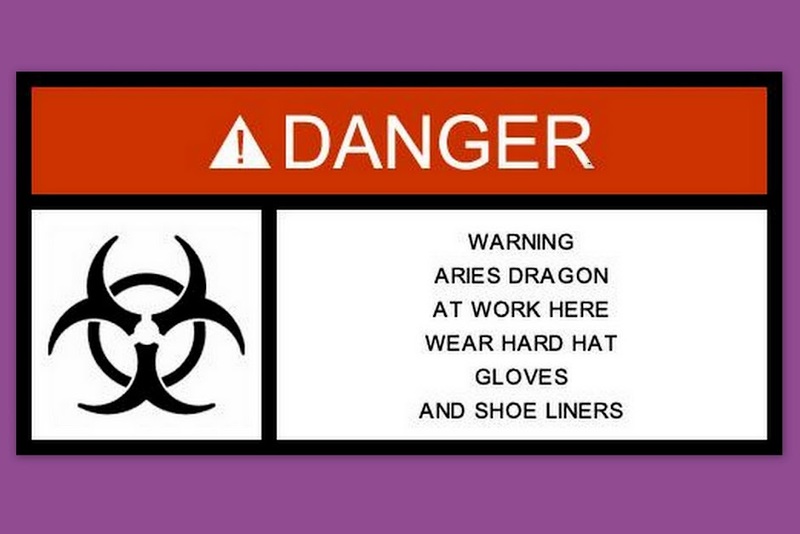 I think I probably still have one or two in my complete loose blue set. I can't remember the Guy's names...how shocking is that, old age creeping-up! They lived at the top of the hill in Guildford as you head out to the Hog's Back, yes - the 'posh' houses, or they were in 1969!! Was it you, do we still owe your bro? 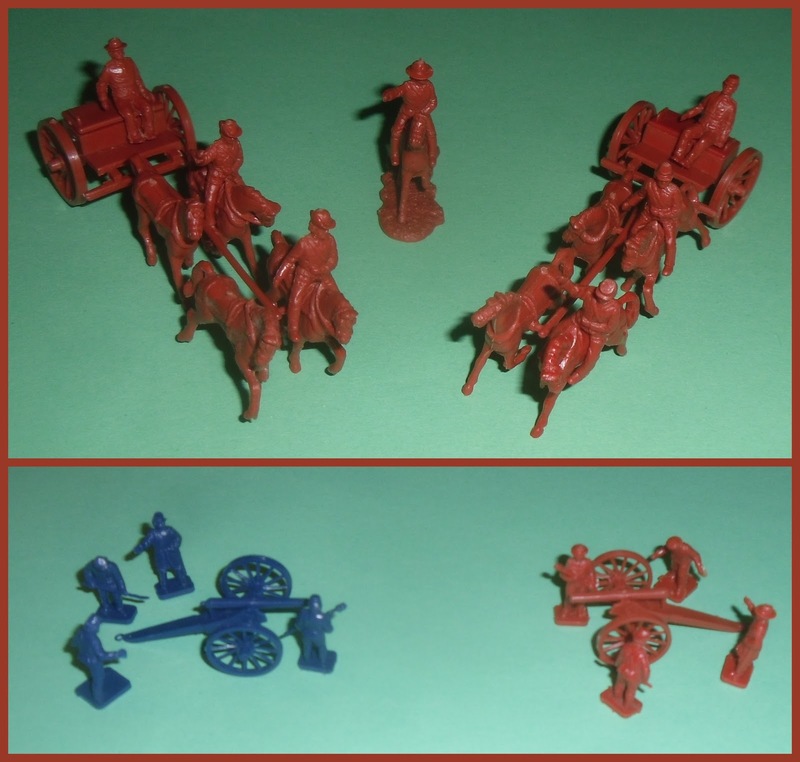 Two mint in box first version sets, the Blue is the earlier, unmarked box (see below) while the 'neutral' Wild West brown would soon replace it, as kids didn't 'get' the two sets of figures all being in blue. The Union got to star on the front of the box. 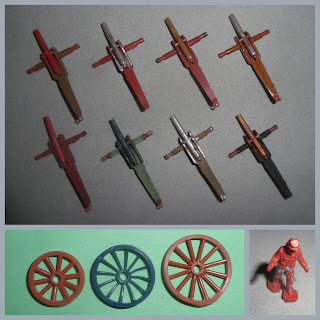 Also this was around the time 'Spaghetti-westerns' started to ease the crusading Wayne's out a bit at the box office, and making them in brown meant you could give a gun-team to your 'Mexicans' or Indian allies!! Upper is the early blue figures box, lower is the brown figures with the US price code in cents ($0.50 - don't know the ASCI for cents here at the library!!). The blue aren't that uncommon; about 10% of the total production, so some would probably have made it into cent-boxes, but I've never seen them in blue-boxes, and if I found one now would assume a dealer had put them there. 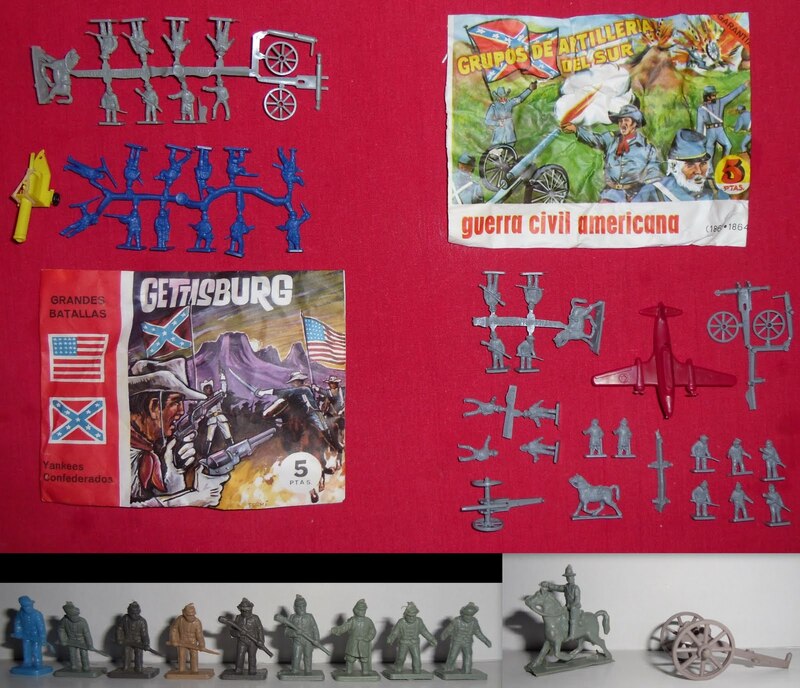 By having the Confederates portrayed, the reverse tried to get the both 'sides' message across, but most of us had ripped the box, getting the figures out...after all we were going to keep them in the Havana Cigar box, what did we want a hollow cardboard box for! "All Federals have Kepis, all Rebels have 'Cowboy' hats! 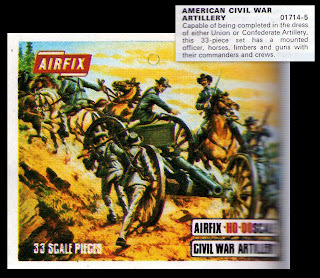 Side-by-side close-up to show the poor quality of the blatant copies next to the originals, I don't suppose the activities of Montaplex contributed greatly to the demise of Airfix, but it was a part of a market denied to them which must have been annoying, especially as it was on the doorstep, but there was nothing they could do with a fascist dictator in charge of Spain's economic activity! And it gives collectors an alternate version to look-out for...bargain! My collection has suffered from a post-1995 surfeit of new-releases which leave me with holes in my knowledge, therefore while I think the gun top-right is Eagle Games, I'm not sure, the others are - from the left; Airfix blue gun, Hong Kong gun of about 1:48th scale which I think came with some CTS or BMC (Americana) bagged rack-toy packs? With the Atlantic Gatling-gun as final member of the line-up. 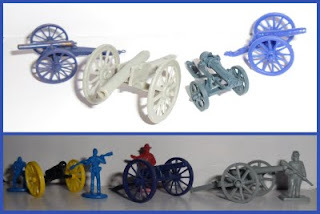 The Gatling and presumed Eagle Games (?) 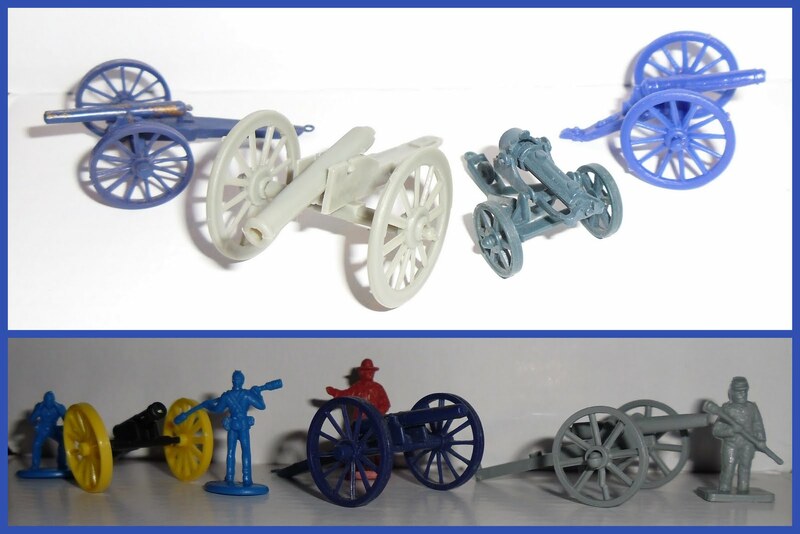 have nicer carriages than the Airfix, but need work elsewhere, the Gatling could use bigger wheels. 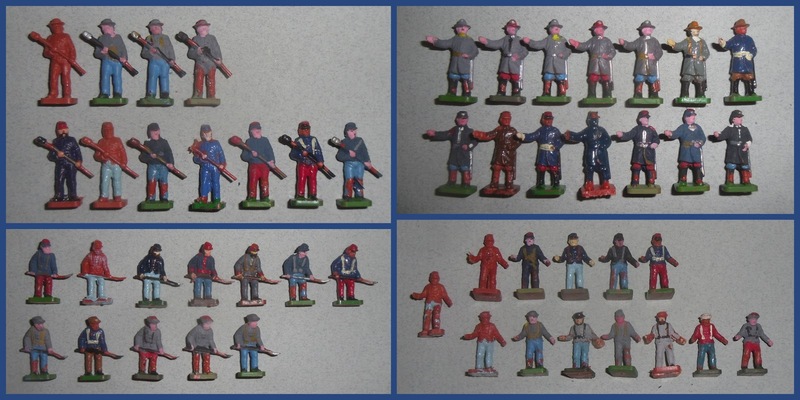 OBEs, in this case full gun-crews, clockwise from the simple; blue trousers, through the classic 1970's look; semi-gloss 'toy soldier' finish, to a fully-painted set of confederates in matt finish with a few touches of 'Artilley Yellow'. "What? They're going to slowly walk towards us across the floor of the valley over that 3-mile expanse of sun-hardened dirt? Watkins! Canister! As much as we've got, and all the shrapnel...No, no hurry, they'll be out of range for a while yet, and then we'll have them for ten-minutes before they can come back at us, and by then there won't be many of 'em left. Harrison; while you're picking lice, do you want to pack our pipes, this is going to be a long afternoon, might as well have a smoke!" 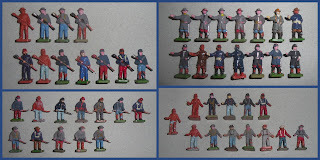 More Other Buggers Efforts - the gun crews. I just love how people tackled their figures back in the day, for some it was a bit of blue, others went for the 'Full Monty', in between was everything else...check-out the gloss-brown Union chap! ...who is seen here in the upper shot - mounted - keeping order between a Confederate 'team' on the left and a Union set-up on the right. Positions are reveresed for the shoot-off in the lower image. More OBEs, the gun getting any metal going! 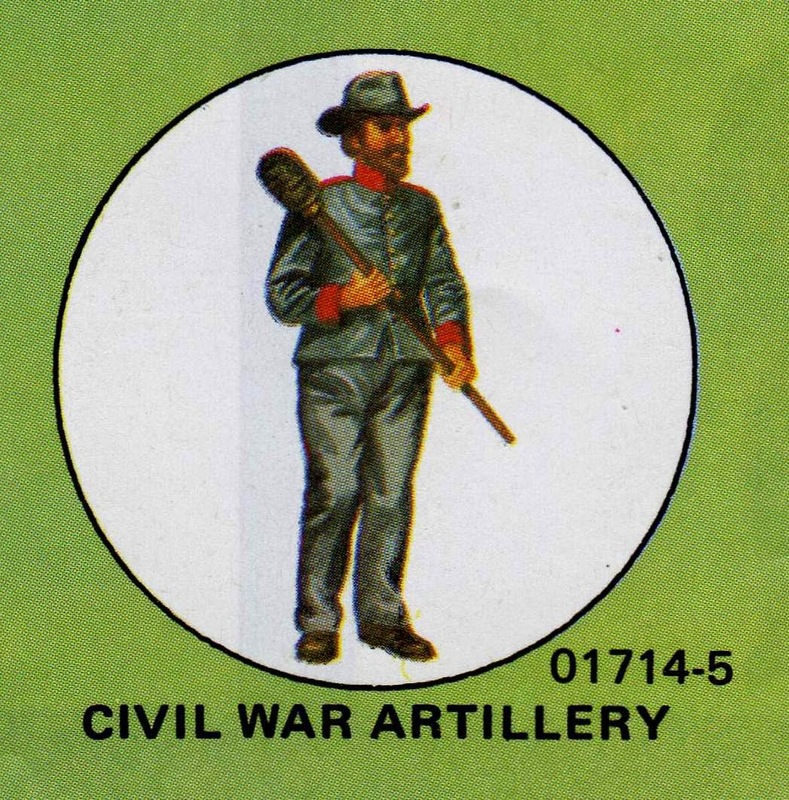 I'm not sure if the two main protagonists in the Civil War had a formal woodwork paint 'rule' like the Napoleonic armies, but both sides used a range of olive or khaki greens, made by mixing yellow or yellow-ochre with black, giving any one of a number of shades. 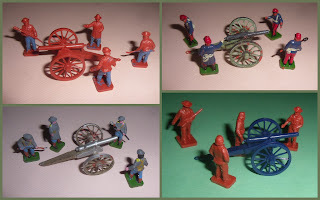 So most of the above would pass muster - apart from the unpainted ones - wrong brown for natural or weathered wood, some of which (bare-wood guns) seem to have been employed, and the CSA had a set of 4 guns at Gettsburg (12pdr. 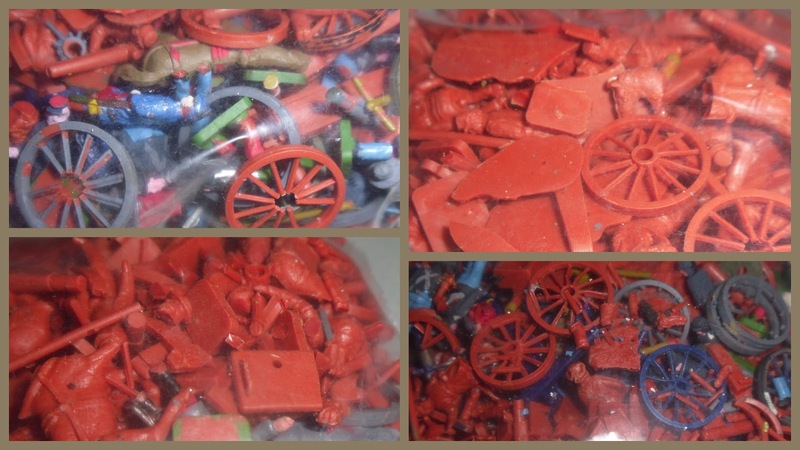 'Napoleon' pieces) which were bright red, that would add a bit of colour to an army! Also - and you never see it on these early painted samples - the seat of the Limber should have a copper finish, as a spark-free waterproofing...and for gunners to polish in barracks! Bottom left show the ACW wheel sandwiched between the Wagon Train wheels, the only other wheel likely to confuse is the RHA wheel, which - if memory serves - has much finer spokes, but I'll check next time I'm in the WWI box and post similar comparisons sometime. Bottom right...1:76 scale 'Dimestore' pod-foot! The later 'blue' boxes, changed the cover-stars to the Confederates, balancing the fact that the Union had been lording it in that position for most of the 1960's! 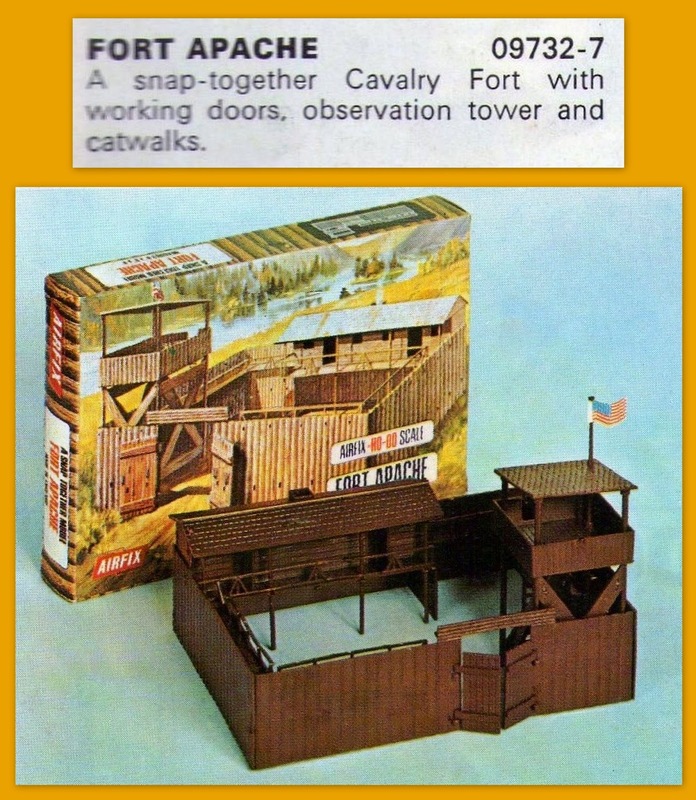 Image here is from the 1975 catalogue and supplied to the blog by Kostas, a follower from Greece.